Didn't like Indiana Jones and the Kingdom of the Crystal Skull? Neither did Shia LaBeouf, and he says that it's his fault. 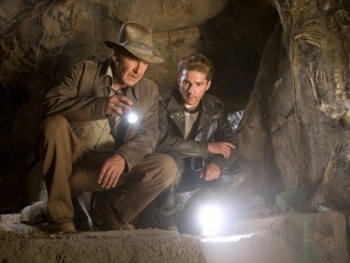 Indiana Jones and the Kingdom of the Crystal Skull may have made loads of money at the box office, but there's no getting round the fact that it had something of a mixed reception amongst movie-goers. Speaking to the LA Times, actor Shia LaBeouf, who played Indy's son Mutt, said that he deserves a significant part of the blame for the movie not being as good as its predecessors. "I feel like I dropped the ball on the legacy that people loved and cherished," LaBeouf said. "You get to monkey-swinging and things like that and you can blame it on the writer and you can blame it on Steven [Spielberg]. But the actor's job is to make it come alive and make it work, and I couldn't do it. So that's my fault. Simple." "We [Harrison Ford and LaBeouf] had major discussions. He wasn't happy with it either. Look, the movie could have been updated. There was a reason it wasn't universally accepted," he added.